I think it is one of the most blog-worthy recipes I’ve made in a while, in fact. The creamy, silky filling pairs beautifully with the shortbread-like crust. Even better, prep is easier than a traditional pie because you don’t need to roll out the dough. And it cooks in half the time. Win win! Tigernut flour – Tigernut is the new “in” superfood. It’s not a nut, it’s a grain-free flour made from nutrient-dense tubers. It lends a naturally sweet, nutty, toasty flavor and shortbread texture to this pie crust. I’ve written about the nutrition benefits of tigernuts here. Tigernut flour is not available in many stores (yet), but you can find it here on Amazon. Sweet potato puree – You can make your own sweet potato puree from roasted sweet potatoes, and I highly recommend my technique for getting the perfect roasted sweet potato every time. Alternatively, I recommend this organic canned sweet potato puree. 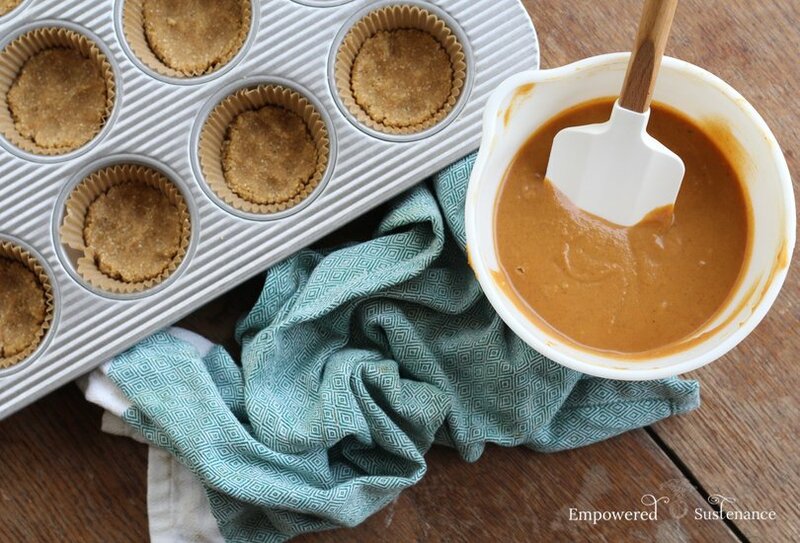 Alternatively, you can use fresh or canned pumpkin puree to make mini pumpkin pies. Coconut butter – Don’t confused coconut butter with coconut oil. It’s the same difference as almond butter and almond oil. I have a post about the various uses of coconut butter here, if you are wondering what else to do with it. These grain free mini pies feature a creamy filling baked on a press-in pie crust. Because the crust doesn’t need to be rolled and fit into the pie dish, prep is a breeze. If using fresh sweet potatoes, I recommend this foolproof method for baking perfect sweet potatoes. Preheat the oven to 350 degrees and line 10 muffin cups with paper liners. To make the crust, combine all ingredients. I highly recommend using a handheld electric mixer. You will have a slightly sticky dough. Evenly divide the dough into the muffin cups and press into the bottom of the cups. Set aside while you make the filling. To make the filling, combine all ingredients, preferably with an electric mixer. Divide the filling on top of the crusts. Bake the mini pies for about 30 minutes, until the filling doesn’t jiggle when the pan is tapped. Cool completely. Serve at room temperature or chill before serving. These mini pies store well in the fridge for a couple of days, but the color is most vibrant before they are refrigerated. If using pumpkin puree, you may wish to use the 4 Tbs. of maple syrup in the filling. Sweet potato puree is sweeter, and you could reduce it to 3 Tbs. 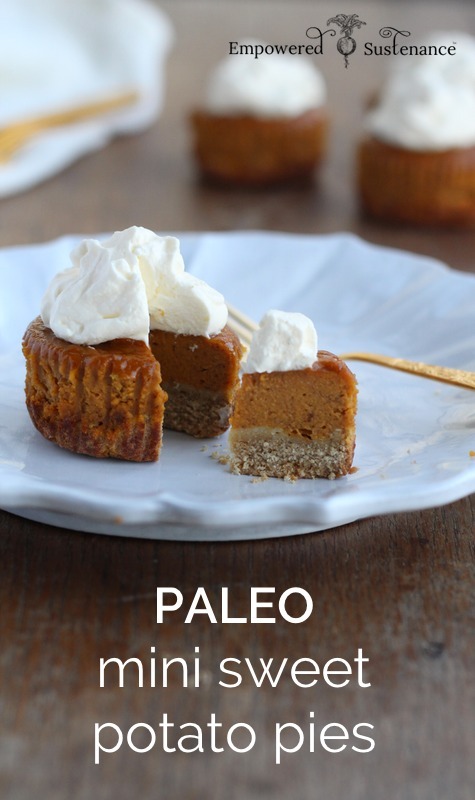 If you prefer a very lightly sweetened filling, you could use even less sweetener and it is still delicious. Coconut butter tends to harden if you have a cooler home or pantry. To liquify the coconut butter, place the jar in a saucepan of hot water, with water coming halfway up the jar. Once softened, stir to create a creamy consistency.